And the Golden Gate: This is the Eve of Shabbat Shirah, the Sabbath upon which we who go to shul are privileged to read BeShalach, the Torah portion that includes Shirat HaYam, the Song of the Sea, which Moses and the Children of Israel (along with many of the adults) sang when the Holy One Blessed Be He guided them through the Red (actually, Reed) Sea and saved us from the pursuing Egyptians in their chariots, who had come to reclaim us as slaves. Moses was then able to lead (but not accompany) the People Israel to the Promised Land, the Land Flowing with Milk and Honey, which (of course) turned out to be the Land of Canaan, which (much) later became the Land of Israel. Not a bad choice, Abq Jew and countless colleagues have emphasized. 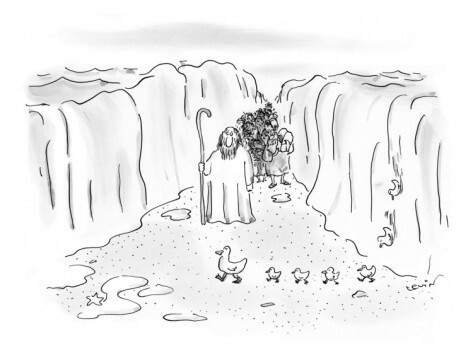 But if Moses had kept going, he could have brought us all to California. "I Left My Heart in San Francisco" is a popular song, written in the fall of 1953 in Brooklyn, New York, by George Cory (1920-1978) and Douglass Cross (1920-1975) and best known as the signature song of Tony Bennett. The song was released as a single by Bennett on Columbia Records as the b-side to Once Upon A Time, peaked at #19 on the Billboard Hot 100, and was later issued on the album of the same name. The song is one of the official anthems for the city of San Francisco. The music was written by Cory, with lyrics by Cross, about two amateur writers nostalgic for San Francisco after moving to New York. In December 1961, in the famous "Venetian Room" at the Fairmont Hotel in San Francisco, Tony Bennett first sang "I Left My Heart in San Francisco". In the audience that night were San Francisco mayor George Christopher and future mayor Joseph L. Alioto. From the 1960s through the 1980s, at San Francisco's premier supper club the "Venetian Room," Bennett sang the city song. It became a hit on the pop singles chart in 1962 and spent close to a year on various other charts, achieving gold record status. It then won the top prize of Grammy Award for Record of the Year, as well as for Best Male Solo Vocal Performance. In 2001 it was ranked 23rd on an RIAA/NEA list of the most historically significant Songs of the 20th Century. 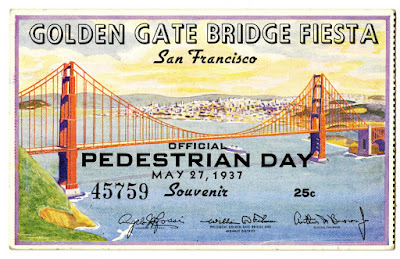 In May 1987, as part of the 50th anniversary celebration, the Golden Gate Bridge district again closed the bridge to automobile traffic and allowed pedestrians to cross the bridge. 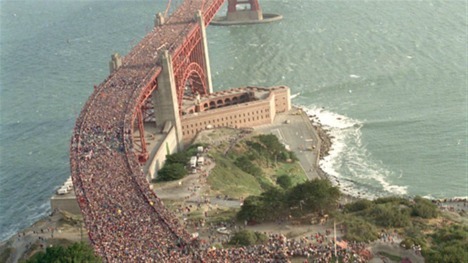 However, this celebration attracted 750,000 to 1,000,000 people, and ineffective crowd control meant the bridge became congested with roughly 300,000 people, causing the center span of the bridge to flatten out under the weight. Although the bridge is designed to flex in that way under heavy loads, and was estimated not to have exceeded 40% of the yielding stress of the suspension cables, bridge officials stated that uncontrolled pedestrian access was not being considered as part of the 75th anniversary on Sunday, May 27, 2012, because of the additional law enforcement costs required "since 9/11".